minutes, seconds remaining to complete purchase. Why? Meet the characters! How can characterisation drive a plot? 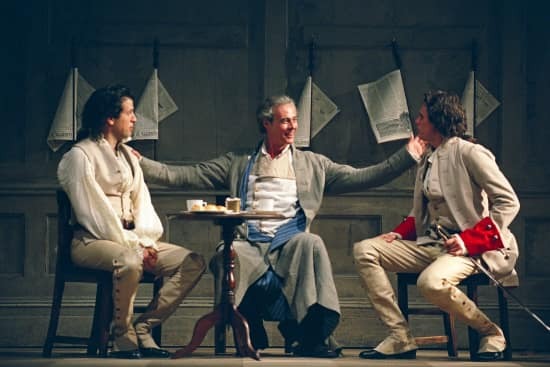 Così fan tutte starts with a trio which introduces the three male characters - Guglielmo, Ferrando and Don Alfonso as they discuss the nature of love. 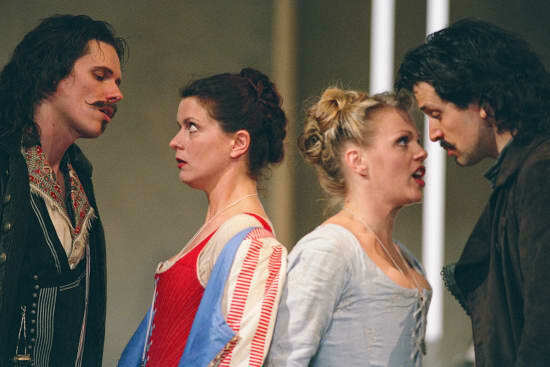 Guglielmo and Ferrando are young lovers, utterly convinced of the fidelity of their girlfriends, Don Alfonso is more worldly-wise, arguing that they should realise that their lovers are only human and, just like everybody else, are likely to change their minds. Read this translation of the libretto, then suggest how you might stage this scene. Where would it be set? Why? What instructions would you give to the actors? Why? Ferrando and Guglielmo’s girlfriends are called Fiordiligi and Dorabella. At the beginning of the opera, we have no reason to believe that they wouldn’t be absolutely faithful to their boyfriends. Their first appearance is singing this duet together. After watching the video of the duet, read the translation. What do you make of this conversation between the two sisters? Why are they having this chat? For each line of the translation, provide a sentence or two explaining what might be in the character’s secret ‘thought bubble’ as they sing. 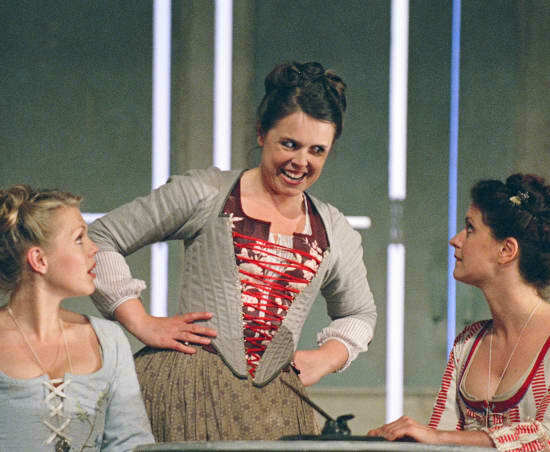 For example, Fiordiligi’s first thought bubble might be - ‘My boyfriend is far more handsome than yours…’. Now listen to the duet again. Does the music match your thought bubbles at all? If so, why, and if not, why not? You have now met all six of the characters in this opera. List them, and beside each name, write a sentence or two extending their character descriptions. Look at them again. How have Mozart and Da Ponte (his librettist) used the differences between the characters to set up the sort of tension that can drive a plot? Now, leaving plenty of space between each, write each character’s name in its own circle. Draw arrows between the characters, and next to the arrows (or perhaps numbering the arrows, and writing underneath), write what the relationships are between each at the beginning of the opera. For example, an arrow between Ferrando and Guglielmo might read: ‘They are best friends, and share the belief that their girlfriends will be true to them’. Read the synopsis of the opera. At first sight, it might seem frantically complicated, but it can be easily distilled. You have been given a brief to write the synopsis for a programme using exactly 100 words. See if you can manage it, without leaving out the most critical plot points. Mozart and his librettist Da Ponte gave the opera an alternative title - ‘A School for Lovers’. If it is a school, then the teachers are the characters Don Alfonso and Despina. Watch the video 'Soave sia il vento', the famous trio sung by Don Alfonso, Fiordiligi and Dorabella. What are the three characters actually thinking? If you drew them onstage, what would their thought bubbles be? What do you think of the character Don Alfonso? When actors and opera singers prepare a role, they sometimes imagine that character’s ‘backstory’. What might Don Alfonso’s backstory be? Why? Despina is perhaps the female equivalent of Don Alfonso - she is the cynical provider of blunt advice. In the famous aria ‘Una donna a quindici anni’, she suggests the sort of things that a young woman should be able to do. Find and listen to a recording of this aria, then read this translation of the words. What does this tell you about the nature of being a young woman in the 1790’s? If Don Alfonso was delivering a similar piece of advice to the boys, what do you think it would be? Perhaps you could write a short set of lyrics for that imagined aria? The title of this opera is difficult to translate into English, because the word ‘Tutte’ is changed in Italian according to gender. In a recent production, a sign was made with a projection of the opera’s title above the stage. 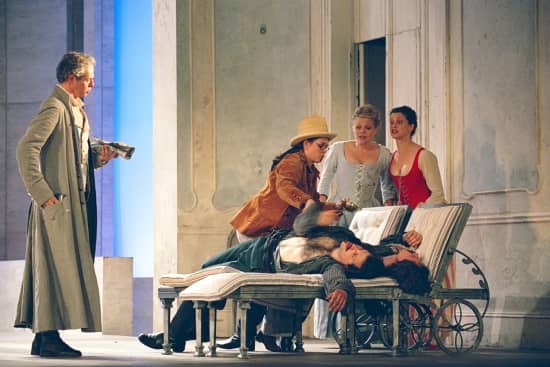 It was made to purposefully flicker between the spellings ‘Così fan tutte’ (‘Females are all the same’) and ‘Così fan tutti’ (’Everybody’s the same’). Based on your knowledge of the opera, which do you think might be a more appropriate title? Do the boys behave any better than the girls? Would things have turned out differently if it wasn’t for the characters of Don Alfonso and Despina? Do you think Mozart and Da Ponte would have got away with such a title in the 21st Century? In groups, discuss alternative English titles for the opera, and be prepared to justify your decision. Select a character and write a diary entry for them from the beginning of the opera. What do they think of the other characters? Follow the opera’s story, and write a diagram of the characters’ relationships with each other at a different point in the plot which you can choose. Can you find other examples of historic literature where advice is given to young people? Try finding Louisa May Alcott’s advice to her daughters, for example, or Polonius’s advice to his son Laertes in Hamlet. What does it tell you about the preconceptions of the time? If you had to write a piece of ‘worldly-wise’ advice to a teenager, what would it be? Can you think of an alternative ending for this opera? Pick a point in the plot at which you wish to take over - perhaps when Dorabella takes the locket with Guglielmo’s picture, for example, and continue with your own plot from that point.